How is humanity dealing with these questions in the 21st Century? “Dawkins made his own jump from the evolution of genes to the evolution of ideas. For him the starring role belongs to the replicator (a DNA molecule, human consciousness), and it scarcely matters whether replicators were made of nucleic acid. His rule is “All life evolves by the differential survival of replicating entities.” Wherever there is life, there must be replicators. Perhaps on other worlds replicators could arise in a silicon-based chemistry—or in no chemistry at all. What would it mean for a replicator to exist without chemistry? “I think that a new kind of replicator has recently emerged on this very planet,” Dawkins proclaimed near the end of his first book, The Selfish Gene, in 1976. “It is staring us in the face. It is still in its infancy, still drifting clumsily about in its primeval soup, but already it is achieving evolutionary change at a rate that leaves the old gene panting far behind.” That “soup” is human culture; the vector of transmission is language, and the spawning ground is the brain. *If you answer these questions, you’ll be awarded a 5 point bonus in the Genetics exam (Feb 25, 10H; Feb 26, AP Bio). This entry was tagged Chapter 10: DNA, Chapter 14: Classical Genetics, Chapter 15: Evolution, RNA an Protein Synthesis. Bookmark the permalink. Recently, we’ve discussed in class how genetics work and what events happen in order for genetics to pass on traits while changing them at the same time. This information can be easily absorbed if it is joined with the main concept of this post. So, let’s say that our gene is the meme “Good Guy Greg.” The very first “Good Guy Greg” gene, for example, says, “Sees you being bullied; tells the bullies to get lost and helps you out.” As soon as the meme spreads throughout the web, some users might adapt it to their situations; this results in the meme undergoing a “mutation”. Just like a gene, the meme “mutates” and changes it’s text, yet it still maintains it’s original purpose: to talk about a guy who does something thoughtful or nice for the poster. These “mutations” can be called the meme’s “alleles,” being different in content but very similar in purpose. Finally, the public selects the “fittest” memes, or the “alleles” most likely to catch the public’s attention, and stay with these popular, alterations of the original “Good Guy Greg” meme, spreading and replicating them across the web like a gene mutating and passing on its alleles to future generations. Excellent analogy. Good Guy Greg might be one of the fittest memes out there, considering its longevity. The same goes with genes—the ones that are better preserved are the fittest. In my opinion, I believe that the genetic concepts of alleles, mutation, selection, etc. make themselves necessary for the research and accuracy of the studies done for the meme. When it comes to memes, the most interesting, funny or striking image with a message (the fittest) survives to approach viral status and associate itself with the world. This comes in relation with how, in genetics, only the fittest eventually survive. Also, the variety of genes and memes is never-ending; as soon as one ends or dissolves into nothingness, another arises taking its place as a gene (and also evolution) or a meme. A meme shapes a culture, as well as a gene does. It’s interesting how such contrasting things- in the sense that one is an essence of humanity (gene) and the other (meme) is a human viral creation- can assimilate with each other and create an extensive study of their similarities and associations. A quote I researched recently which made the whole scenario of memes and genes sound that much more enthralling. Phrased this way, you can summarize how both actually work together in a society and vibe off of each other’s existence. A gene, a small, essential thing, is the key to the creation of a human. A meme is a creation of a human, a stimulation of the mind. It all moves together in collaboration. The comparison of the meme and gene is another fine example of the constant, wondrous theme: evolution. Keep in mind that the word ‘meme’ was coined by Richard Dawkins, a biologist. But it’s still fascinating that even if the term technically came from science, the concept still evolved into something I bet Dawkins couldn’t have fully and completely predicted. Yes, I do think that the things we have discussed in class about genetics are applicable to these findings. Genes, just like memes change and adapt through time. Each time a person wants to use the meme they change a bit of the context but the foundation stays and the pusrposes of the meme are all alike. Each of this changes of the meme would be the alleles of a gene. As for selection, there would be some memes that people like the most. These memes will be seen more often in the internet and through time just as the best genes are passed form one generation to the next. Indeed. Variations of memes over time would correspond to the alleles, or the alternatives we have for genes. Yes, I do think that the things we have discussed in class about genetics are applicable to these findings. Genes, just like memes change and adapt through time. Each time a person wants to use the meme they change a bit of the context but the foundation stays and the pusrposes of the meme are all alike. Each of these changes of the meme would be the alleles of a gene. As for selection, there would be some memes that people like the most. These memes will be seen more often in the internet and through time just as the best genes are passed form one generation to the next. This blog post was discussed in class this week and I saw it at first and thought, “Wow that couldn’t be a Meme.” As we kept explaning its meaning I couldn’t fully grasp the concept and how it was a Meme. I then started reading and saw it was a mutation that changed colors in a timing prompt. This picture seemed to connect in my head with other things in science and not only art and internet clicked in my head but also cells o nerves. Then we started talking about genetics and it the picture still made no sense. I started giving thought into this while reading and observed that the mutation changes if you manipulate what the Meme says. Gregor Mendel did this with the flower plants in his experiment to observe herdeity. He manipulated the plants by doing cross-pollination in the flowers and observing the changes that occured to the offsprings. I now linked this picture with the topic in class and it all makes sense. Day by day science and technology will help find new ways to cure and understand future problems or questions. Manipulation of traits—which is nothing less than artificial selection—has yielded a bunch of plants and animals that have made our lives easier. The same can be said of human language, which is subject to change and variations in ways that resemble genetics. I like the way you used the word—which is actually a meme in itself—’fail’ in relationship with ‘mutation’. I believe the findings discussed in class definitely contribute in the making of memes. Memes transfer information through cultures as well as alleles transfer traits to further generations. Memes also resemble mutations because just like every meme is not the same and they change through time mutations are changes that occur to the human body. If it were not for this blog I would have never made this connection. Memes are similar to science concepts but are also helpful in making people aware of new discoveries in science. Through memes we can learn science concepts. In conclusion memes are very helpful and should not be seen as only a way to make jokes or play. The key word here is ‘change’: change in function of time, change in relationship to quantity. Both memes and genes are subjected to change and time. Maybe that’s why they have so much in common. Genetics and evolution practically go together hand in hand because thanks to cross matching, mutations and DNA we organisms evolve and change. Since we are based on DNA and DNA molecules change in time, then we actually change in time maybe physically, mentally or emotionally. Change is the underlying theme in all of science. The things discussed in class about genetics definitely are applicable to the findings. Genetics are like memes (as just said), but I see it this way. Memes, like the “Bad Luck Brian”, pass down information on a certain topic, the same as genes, but the difference is that the genes are for traits. Genes mutate, like memes, for example, “Bad Luck Brian”. In this meme people change the situations in which he presents his bad luck, but the circumstances that Brian goes through are all based on the same topic, which is his bad luck. Even if they are different, they are variations that have the same topic. Just like in genes, there are variations for the same trait (alleles). You can have different alleles for a gene, but they all have one thing in common, which the determination of the trait. In conclusion, genes are memes and the alleles are the variations of the situations. And, like genes in the biochemical context, the possibilities for memes are virtually endless. I think that these findings do apply to what we have discussed in class. Genes change, if given time, just like what happened with the memes. In genes, these alterations are called alleles, which are basically different variations of the gene, just like how the memes had different modifications. Sometimes in the memes only a little part would change, this also happens in genes. It is when only a snippet of the gene changes and, instead of being passed “down” from generation to generation, it is passed laterally. Another way that memes resemble genes is in the way they evolve to survive. If you observe memes, you will probably notice that they change. They do this in order to “survive”, or get more attention. Just like genes, they evolve to be able to live longer. ‘Evolution’ can be applied to every phenomenon that is subject to change–from stars to words, from atoms to genes. Evolution can be interpreted in the way it was changed, adapted and copied although it is not for survival, it still is altered in different ways. It can be changed to fit the likes and ideals of people and it can also be changed for humorous reasons like the changes involving beer and Jabba the Hut. In genetics, mutations can be deletions, additions, and substitutions. The same thing happens with memes. Another thing that came to mind when reading about memes was a game I have seen where many people sit in a circle and one person starts a secret told once, it is then whispered in a chain or order until it reaches the one who started it, the thing is the secret many times gets altered depending on what did each person hear from the previous person. That game is a pretty good model of what we’ve been discussing in this blog post. There’s certainly a connection between the topics discussed in class, such as genetics, with the eye catching images from the internet know as memes. Genetics is very relatable to memes considering both undergo mutations. A mutation is basically change and life is all about change and evolution. Like mentioned on previous comments a mutation on a meme would be an addition to the text or a change in perspective that is still based on the same topic from the beginning. Life changes, we change, relationships change, genes change and so do memes. In genes we find alleles, which are alterations or basically different variations of the gene. Changes occur in order to adapt to other changes or just to proceed in life. Changes in memes are made with the purpose to capture more attention from the public. This observation of relating a meme to different topics such as genetics really surprised me. I don’t think I would’ve recognized such interesting connection! Many great connections can be made between information technology, such as the Internet, and biological systems. Consider the World Wide Web. Many information scientists believe that its behavior is starting to resemble one big brain. Life is a chain of reactions. We see how things are linked to one another everyday and everywhere. Memes and genes are just two examples of how objects are changed and altered. Even though they are two completely different things, they undergo similar processes; one through the internet and the other through the passing of traits among organisms (through offsprings). As they appear in different screens or people, the human brain absorbs them and gives it a unique interpretation in which the trait or meme is applied to their situations and used in slightly different ways than how they were originally used for. That’s when the entities being discussed undergo “change”. Even though they are still the same object, they are used differently. Therefore, we can say that (although the factors are far apart) there is some resemblance in the way in which memes and genes develop. It s important to note that there is an evident resemblance between the behavior of genes and genes; but, we have to be careful. That resemblance has its limits, as we’ll see in the next few days, when we discuss the molecular basis of inheritance. In the 21st century, technology has had a great influence on modern day science. When I read this post about genes and memes, it amazed me to learn how memes, if popular, can be stretched throughout a network reaching all parts of the world through various internet networks, just like a gene, if dominant or fit, the trait or allele can keep producing or continues to reach the different organisms. I agree with something mentioned ,” In many ways memes shape the culture and communities through which they move.” This statement can also be applied to evolution. Through evolution, we get the traits we need in order to survive, and these are passed from generation to generation. Memes will transmit a message according to the appeals of the majority, just as genes will continue to evolve and adapt to the needs of the time. This happens a lot in science. Take the example of fractals, a mathematical phenomenon that describes many biological events, including the pattern that branches of trees take. It is amazing how biology has so much to do with memes. Our discussions in class have to do with these findings. We can compare memes with genes since both change through the years. At first I didn’t understand very well what a meme had to do with biology but after reading and reviewing this blog post I could get the idea that a gene and a meme are really similar and also that a meme and a mutation are basically the same. A meme changes through time just like a mutation changes in a body. The link I found is a song that tells us the difference between a meme and a gene. I’ve heard the song before. A very weird song. The presenter of your link is Richard Dawkins, the guy that invented the word ‘meme’. The concepts discussed in class are applicable to these findings. It’s amazing to see how memes are so closely related to genes. An internet meme is an idea, style, or action which spreads from person to person via the internet, as with imitating the concept. Genes also change and adapt through time. Thanks to this blog I could see the connections between genes and memes. I would never have thought of these analogy of memes and genetics. It really is true that these two things are related because a meme is created and posted on the internet and each person keeps passing it from one to another and it could change. The same happens with genes. Genes and traits pass from one generation to another and they can vary of change with the time. Obviously memes are easily spread and faster than genes. Here is a link i found interesting about the competition of these two. I had never thought about the similarity between a meme and genes through evolution. It is mind-blowing to think about how they can be considered metaphors of each other. A gene is a meme in facebook or any other website that is passed on from generation to generation, or from place to place. As they pass on, the memes evolve into something else, as well as the genes. Thinking about it makes me realize how everything connects to science. Remember: DNA is biochemical information. I think it’s interesting how things in human culture evolve a lot like we evolve in terms of biology. I never noticed the parallelism between the two; how different genres of music will evolve in different places, creating “sub-genres” or with internet memes like the article above talks about. We see how more successful fads keep evolving while the less popular ones are eventually forgotten, like how the most successful organisms will prosper and evolve while the least adapted will die off. It is amazing to see the lengths that a person’s creativity can go. I would’ve never thought that there was any type of analogy between genetics and internet memes. Technology has evolved through the years and with it, the depths of the internet have become infinite. Every time a meme is posted and re-posted it evolves, taking a different approach but with similar structure. Just like with genetics. Every time an organism evolves, its genes change and evolve, receiving different characteristics than the previous generation but with similar traits as them. Becoming aware of the creativity behind this analogy, we can realize that every thing in life, either material or living, is connected in some way to science. Science is a phenomenon that cannot be ignored or escaped. I know creativity and having an open mind is an extremely important aspect of life but specifically for science. Getting to know how genes work is extremely curious. Genes even have specific rules on how to be chosen and how they pass from a parent to an offspring. They are either dominant or recessive and this is what determines which trait will be the one that is seen in the offspring. Creativity and curiosity are, probably, the most important traits that a scientist should have. An artist also benefits a lot from these traits. DNA, and mutation can occur potentially anywhere on molecules at any time. The most serious changes take place in the functional units of DNA, the genes. A mutated form of a gene is called a mutant allele. A gene is typically composed of a regulatory region, which is responsible for turning the gene’s transcription on and off at the appropriate times during development. Once again, science proves that it has a world yet to be discovered, who knew you could relate genes to social media? It is clear that the way science influences us constantly has no boudaries. When scientists like Mendel or Darwin were making their own investigations, they did not have these advantages such as the Internet or communications like we do in the 21st century, imagine the world we can discover if we unify all the great inventions that have been made during the past decades with common science: we look forward to an unstoppable world. What a curious thing! We didn’t even know that we were copying nature as we created memes. But know that I think of it there are many things that we have copied from nature. Take computer programs, aren’t they like all the cycles in biology, continuous and with a specific purpose? Or when we use a keyboard to type a paper, we are using “codons” (letters) to make “proteins” (words). Who knows what we might copy next without knowing it!!! Creating a meme gives ordinary people a chance to become scientists by observing and finding clever ideas and information, and using them in a fun and creative way. Without question, Science is found in life every step of the way. It is astonishing and even funny to learn about all the interactions we are able to conclude by mixing Biology and Genetics with our life and humor. I would have never imagined the comparison between Memes and genetics, but now that I read about it, it makes complete sense. This is where the “funny” part of this interaction is seen. A meme is compared to genes, because just as genes keep mixing with other genes, they will keep evolving and changing for more suitable results, this process is also perceived in the evolution of the popularity in a meme. A meme first starts as an original thought, then as it keeps on being watched, posted, and talked about, different people begin to change its sayings or purpose, where the most funny, familiar, or suitable purpose is the one that survives and strives throughout the internet communications. One can think of this “mixture” with even a more direct interaction of Science and humor, seen with the very famous “Chemistry Cat” meme. Researching more about “Memes and Genes” I found this link where they are compared in other ways like in coevolution, opposition, and even with viruses. Networks today are a basic structure of daily living. Because of the internet, because of the cosmos, because of public and social gathering. The basic human need for company. This post is very intriguing because of what it mentioned on networks. Yes, its true that memes are like genes, people re-use them and slightly change them with their creativity, and make it their own. It’s strange how we visually represent networks is an image similar to cosmos. 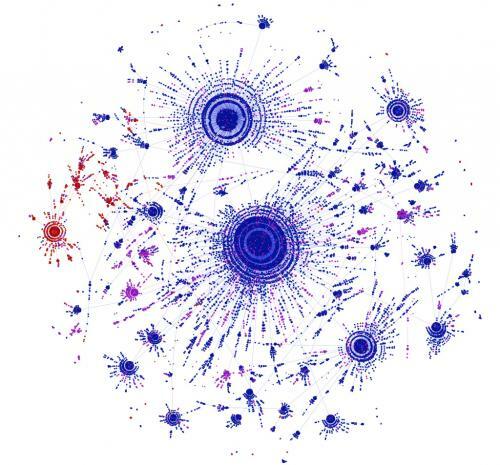 The model of a network is much more useful to study sociological patterns.